If you want to feel like a king or queen for a day, The Spa at Excalibur & Fitness Center is the place to be. Overlooking the pool area and spanning 13,000 square feet, this world class spa truly must be seen to be believed. Let us pamper you with a wide variety of facials, massages, body wraps, and other treatments in one of our eleven specialized treatment rooms, or enjoy a rigorous workout in our state of the art fitness center. For your convenience a 20% service charge will be added to each spa and salon service received. A portion of the service charge is dispersed to the spa and salon staff members who served you and the remainder is an administrative fee. Additional gratuities are at your discretion. A 20% service charge is added to all services, Must be at least 18 years of age to use the facility. No substitutions. For appointments, visit The Spa or call 702.597.7774. Ask about our special Monday through Thursday pricing on our spa treatments (Not valid with any other offer). A 20% service charge is added to all services. Must be at least 18 years of age to use facility. Get a 25% discount on any 50 minutes or longer spa treatment with a valid military ID. Excludes Packages. Take 20% off any 50 minutes or longer spa treatment with a valid Nevada ID. Excludes packages. Some couples enjoy being together every minute of the day.Some prefer each going their own way, then meeting for special experiences. Either way, a side-by-side massage makes a wonderful gift. Choose from Swedish or Custom. Call 702.597.7774 to book your appointment. If you’ve been on your feet too long, it’s high time you discover the essence of deep relaxation with one of our most celebrated massages that’s also perfect for beginners. Using the palms of their hands and the occasional elbows and forearms, your attentive massage therapist will apply light to medium pressure in a free-flowing motion. This massage eases weary muscles, increases circulation and promotes supreme relaxation, stress relief and feelings of well-being. Should you be athletic, or have chronic muscle tension that requires extra pressure to ease aches and pains, this massage offers a luxurious respite from ongoing issues and knots. Using medium to deep pressure applied with elbows, knuckles and soft fists, this massage is less free-flowing but more specific to the muscles that really need it. It’s quite simply the ideal stress reliever. Bring us aching hands and tired feet and we’ll massage all your tension away with stretching, acupressure, massage and moist heat. Deepen your relaxation with gentle, yet rock solid, warmth. This specialized heat therapy combines the free-flowing motion of a Swedish massage with the deeply comforting heat of hot stones without the heavy pressure of a deep-tissue massage. It will put you completely at ease. Being a mommy-to-be will be that much more joyful with this soothing Swedish relaxation massage. This treatment is perfect for women in their second (14 weeks +) and third trimesters. No substitutions of services are allowed in spa packages. Spa packages are based on availability. All rates subject to change. A 20% service charge will be added to all spa services. Cancellation policy is four hours prior to committed service time. 50% will be charged for all cancellations within the four-hour service window. 100% will be charged for no shows. *Aromatic lotion is only applied in the 50 minute treatment. For the ultimate in pampering and relaxation, allow us to massage your worries away with this stress relieving treatment. After warm, moist towels are used to moisten the hair, aromatic conditioners are massaged into the scalp. Whether you want to top off another treatment or enjoy this on its own, you’ll love the way you feel! Moisturize every pore deeply with your choice of a soothing aloe, eucalyptus, aroma or herbal wrap. Enjoy getting all warm and cozy as we gently wrap you into a Mylar® blanket. Should you suffer from heat allergies or heat sensitivity, these body wraps are unfortunately not recommended. If you are sunburned, aloe wraps without heat are also available. Lavish in the essence of herbal healing with our most popular and most detoxifying wrap. Your skin will feel absolutely blissful with this moisturizing wrap. Choose from among our sweetest scents before easing into this relaxing wrap. Relieve upper respiratory issues caused by smoke, sinuses, allergies and more with this invigorating wrap, which also applies eucalyptus to the chest and back for additional relief. Ease into this refreshing, relaxing facial including a gentle cleansing, exfoliation, mask, toning and moisturization, perfect for first-timers and beginners alike. Uncover a new you with our most popular facial, customizable to your own individual skin tone. This restorative facial will cleanse, exfoliate and decongest your pores with a mask suited to your skin type, along with a relaxing massage of the shoulders, chest, neck, arms and hands. Highly recommended for a full facial experience, this facial is a natural extension of our Self-Renewal Facial. Enjoy the full benefit of cooling and clay masks for our most relaxing facial experience. Only available as enhancements, and not stand-alone treatments. Plump up your lips beautifully while reducing fine lines, moisturizing chapped lips and creating a fuller looking smile.This essential service is also a great way to firm and tighten your lips. Firm and tighten your neck while moisturizing and hydrating the skin with this soothing and refreshing lift. The ultimate way to both soothe and refresh, plus firm and tighten the skin around your face while minimizing pores. There’s nothing like a classic and once you enjoy having your nails clipped, your cuticles pushed back and trimmed and your fingernails polished, you’ll love how they look. A moisture rich lotion will also be applied to your hands during the service. This exceptional manicure includes all of the services offered in our classic manicure as well as an exfoliant scrub, followed by a treatment mask with hot towels, lotion application and standard nail polish. Get off your feet and into an express pedicure in no time. This pedicure service includes nail clipping, push back and trimming of the cuticles and a standard toenail polish application. Our classic pedicure will make your feet feel fantastic. Enjoy a nail clipping, cuticle push back, trimming and callus filing, before we rub down your feet with lotion and polish your toes, leaving your feet as good as new. The essentials for making your feet sparkle. This exceptional pedicure includes nail clipping, push back and trimming of the cuticles, callus filing, an exfoliant scrub and treatment mask with hot towel and lotion application before we gorgeously polish up your toenails. Walk towards the casino table games and take the walkway to the Resort Tower Rooms. Once you go out the first set of glass doors the Entrance to the pool and spa will be on your left. All treatments include a 20% service fee. Must be 18 or older to use facility and services. Enjoy an invigorating workout in our state-of-the-art Fitness Center, overlooking the pool. 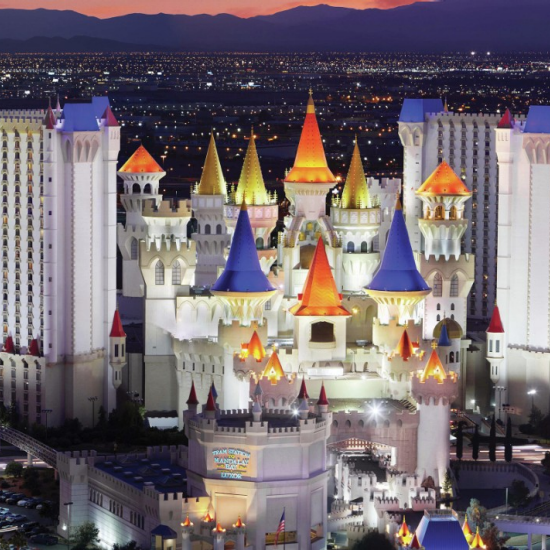 You won't want to leave town without a suitcase full of Las Vegas souvenirs.